by HERBERT B. WORKMAN, MA. 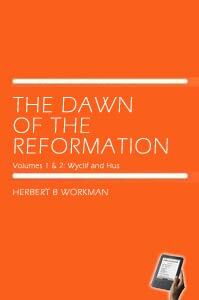 I HAVE entitled this little work The Dawn of the Reformation. My purpose is to trace the various influences and forces both within and without the Church, which produced the great revolution of the sixteenth century. At what hour" dawn" begins is always a matter of dispute, and depends largely on local circumstances. But one thing is certain. A new day has begun long before the average worker has commenced his toil. So with the Reformation. The study of its causes cannot commence with Erasmus or Savonarola; its methods and results were to some extent settled for it in the century before Luther or Cranmer. My narrow limits have compelled me to omit many things of interest, and to compress into a few lines others which demanded as many pages. I have constantly realised that to write a small history is more difficult than to write one of larger margins. In what I have included, as well as in what I have omitted, the understanding of the Reformation and its causes has alone had weight. If it be objected that I have given a disproportionate space to Wyclif, or made him bulk larger than he did in his own day, I must plead that his life has scarcely received the attention it deserves. The materials, in fact, for estimating his work and character have but recently become generally available. Whether or not it is yet possible to form an accurate statement of Wyclif's position may well be doubted. Much work, it seems to me, will yet have to be done before we may know for certain how the Reformer influenced his generation. For instance, I have dwelt somewhat at length upon the Spiritual Franciscans, because I have felt that Wyclif's whole work is saturated with the ideas of this movement. The violence of his language, which has shocked many, is chiefly borrowed from its current polemics. Arnold's most useful Select English Works of John Wyclif needs also, in my opinion, a careful revision. His argument (Introd. viii-xii) can scarcely be upheld, and vitiates several of his conclusions. That Wyclif's English works will always be a difficulty may readily be acknowledged. But we may reach greater confidence by a careful comparison with his undoubted Latin treatises, as also by a comparison with such works as Purvey's Remonstrance. The higher criticism is always dangerous as an historical guide, and I have carefully excluded it from the following pages. Nevertheless, I have a deep suspicion that Wyclif was rather the head and inspiration of a school of workers than himself actually responsible for all that passes, even today, under his name. We may acknowledge, however, that to make Wyclif anything like consistent would require a pruning-knife, which would leave very little untouched. His very inconsistencies are not without their use. By reason thereof Wyclif forms, like Constance in the next age, a convenient centre round which to group the various forces of revolt. In him for the most part they find their contradictor)' expression. To the critics of my former work, The Church of the West in the Middle Ages, I return thanks for their uniform kindness. One and all have recognised my desire to be absolutely fair. I desire to write neither a panegyric nor a polemic. There are few matters over which the advice is not the wisest — audi alteram partem. Of the many defects of my work I am deeply conscious. But one thing I may plead with confidence. I have no ecclesiastical axe to grind. Nonconformity is not, in my opinion, as some critics would have us understand, altogether a hindrance to historical study. On the one hand, it is true, the Nonconformist loses some degree of sympathy with, and inner understanding of, the life and faith of a church diametrically opposed to his own. On the other hand he gains, or rather should gain, in impartiality by this very detachment. The Anglican historian, however fair, is always liable to the temptation of pointing out the lines of his own growth; his weakness in dealing with the Reformation is his anxiety to prove that there has been no break in continuity. The Nonconformist, on the other hand, should be delivered from this bias. Of his own complete break of continuity, whatever be the case with the Anglican, he can have no doubt. His polemical contention, that this break is really a reversion to earlier type, should not be allowed to colour his historical examination of how this great break occurred. This, at any rate, is my ideal — how far I may fall short I must leave to my readers to decide. I plead indulgence for a task carried on amid many difficulties. To the pressure of a busy pastorate, I must add the difficulty of readily obtaining the necessary books. Visits to the British Museum do not compensate the student in a provincial city for that which he misses at his own door. The sources of English history are generally provided; but beyond that there is a blank in the catalogues that reminds one of the early maps of Africa. As things at present exist, Manchester is the only city in which it is possible for the provincial student to find the sources he needs. This is especially unfortunate for Nonconformity. Our strength lies in provincial centres, where the intelligent study of church history, as distinct from compilation, is almost an impossibility. A word may be advisable as to the notes and references. I have taken care to quote the sources of all my important statements. With the present fashion of writing history, especially textbooks like the present, without note or comment, I have little sympathy. However inadequate the notes I have supplied, they may at any rate serve the reader as a guide to future study, and furnish the student with a means of estimating the value of my judgments. In quoting sources, I have indicated the editions I have used, and in other ways sought to help the young student. In a few places I have thought it well, for the sake of greater completeness, to refer to works which for various reasons — chiefly because the subject lies outside my immediate purpose — I have not used or verified. Such references are invariably distinguished by a †. The reader should also note that quotations from sources reasonably contemporary with the event in question are enclosed within '...' while quotations from later writers are enclosed in the usual "..."
The Index, I may add, is postponed to Volume II.